Bubba Kush is a wondrous strain that exemplifies everything that is right with indicas. The great yields and relaxing highs will have indica lovers coming back for more. A child of the nineties, Bubba Kush was a creation of the famous breeder known as Bubba. Throughout his years as a student he had been experimenting with growing various strains, including two separate strains known as Bubba and Kush. At the time, Kush was a tough strain to grow and get just right, but Bubba described it as some of the best stuff around, making the effort required to produce it worth it. It wasn’t until he moved to Los Angeles that the Kush and Bubba strains accidentally cross-pollinated and mixed, resulting in the wonder child that is now Bubba Kush. 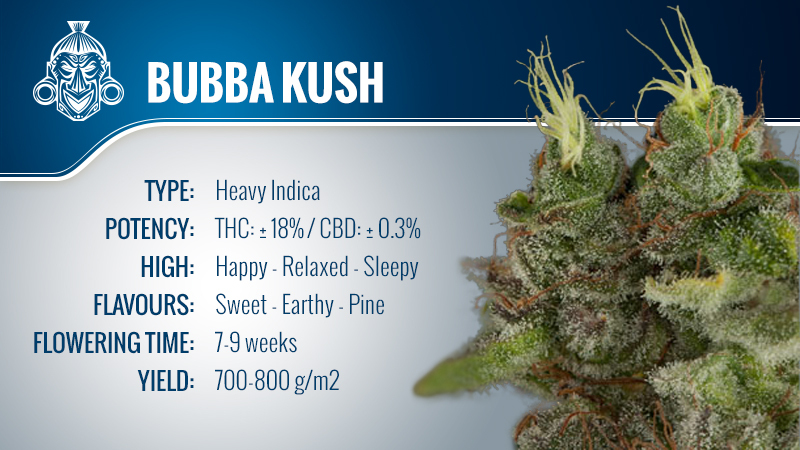 Bubba Kush is indica dominant strain that shows all the typical indica characteristics. It grows short in stature, with multiple branches and laden, heavy tops. As it comes to fruition, it becomes covered in vibrant red hairs and potent THC crystals. A crop grown under an experienced hand has been known to yield outstanding 700-800 g/m2, and when you consider it tends to have a flowering time of 7-9 weeks, it is easy to understand why it is such a popular strain. Bubba Kush’s reputation as a world class strain has not only stemmed from its superior growing traits, the majority of its fame has come its smooth smoke and signature high, an experience that has many connoisseurs convinced. The smoke of Bubba Kush has a predominantly sweet overtone, with earthy and pine flavours also coming through. As would be expected from a high end indica strain, Bubba Kush induces a happy and relaxing state, washing away pains and aches. 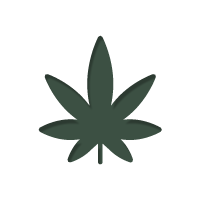 The nature of the high can make it quite a problematic daytime smoke if you are planning to get anything done; but if you need a strain to relax at the end of the day, or one just before you go to bed, the Bubba Kush may be the one for you. Its relaxing qualities make it ideal for those who suffer from sleeping disorders - sleep comes easy from Bubba Kush. Be warned though, this is a fairly potent strain, and over indulgence can lead to couch-lock and a serious case of the munchies. On the whole, Bubba Kush has everything an indica lover could want. The high yields, fast flowering times and top shelf experience are all perfect examples of why this strain is so in demand. However, Kush is known to be notoriously hard to get just perfect in some grow situations, and whilst this trait has not been fully passed onto Bubba Kush, it still requires a moderate knowledge and level of experience to get the best out of it. It is still possible for a novice to get good results, but it needs that little extra to push it to the limits. For this reason, we give Bubba Kush a 4 out of 5 stars.